Yesterday morning I set off early,8 am for Gaithersburg and the beginners quilting class. Didn't take any longer than I expected but left an hour earlier just in case there was an accident and holdup on Rt. 270, the main corridor to Wash. DC. At 5am till 8 this is a parking lot. Why these people want to live in the suburbs and drive 1 1/2 to 2 hours to work every day is beyond me. So arrived finally , after getting on the wrong road. to find the shop doesn't open till 10 am. the time the class was to begin. Fortunately I had taken my book with me just in case. About quarter til 10 the gal came and opened up so after another lady went in with a machine I got out in a little rain, but since I parked right in front of the shop. It was an easy in-out. Got my machine unpacked and set up. The teacher came and was almost as old as I, so figured she would be good. There were 5 of us in the class. 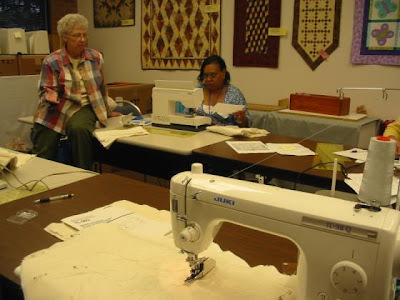 Most had never done any machine quilting. 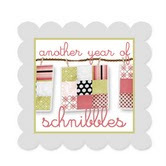 One hadn't even taken a class on how to use her Bernina. We were given a few instructions and shown some quilts with the types of quilting we were going to learn how to do. This is the teacher talking after the class was almost over. I shyly got my camera out and snapped this one. This is my Juki with the sample practice in the machine. This shows the 5 steps she had us do. First we copied a design in the middle. Then folded the square and creased the 4 squares. In the upper left corner we did meandering which doesn't show up, thank goodness but I think with some more practice I might get the hang. Then we did echo in the opposite corner. If you can see. I didn't follow instructions and only went to half of the square. Shame on me. but then filled in the other half. Then we did cross hatching in the upper right corner and in the lower left it was suppose to be double needle. But my Jukie doesn't have the foot for zig-zag so I had marked the double lines to follow using only the plain quilting foot. She gave us several good pointers. One to have your chair high enough to look down on your machine. Hasn't been. I put another chair on top of one and that was so much better. Then she recommended using the # 70 quilting needles. Finer for better quilting. I had # 90 but think they work better for the heavier quilting I'm doing now on the flannel quilt. She explained a little about the batting. 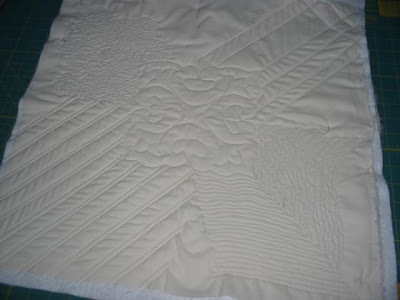 Was surprised she uses the poly for small quilts , like baby ones and ones you want puffy. It was good to have some one on one teaching. My DH asked it it was worth it. Sure , when I've not had any except the cyber teaching from Kim. Which has been great. Never thought I would give in and do machine quilting. 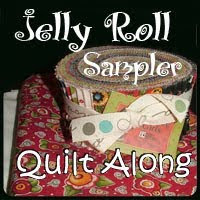 but it is so much better for quilts to give away like for my grandchildren to take off to college. I've made quilts for all 6 of my grandchildren which they will get when they get married or out on their own. But have also made them ones for their bed growing up . and these have been hand quilted. Now the oldest that is in his last year at college. Had a quilt we made with fish and used a whole lot of Old fabrics and he had that on his bed until he left for college. It started to wear. Some of those old, 40-50s fabrics just couldn't make it. Last year I gave him one that I had machine quilted , for college. As I had given the two girls each one the year before for the college quilts. Well, my DD had asked him if he was using it. No, he was afraid of ruining it. I told him he was to use it .That was what it was for. That he would have another big one when he married. Don't know if he has . So this morning I got my machine set back up and started to quilt the flannel one for my DS's family for Christmas. I Have shown it in an earlier blog . Am only going diagonally through the big blocks so nothing hard about it. I started to use the walking foot since it was flannel but for some reason it keep catching. So changed to the regular foot and it was working good. What a learning progress this is. But never to old to learn something new. I think our rain is finally coming to an end. But boy did we need it. Looks like you were a good student, your sample looks great! You're really getting the hand of machine quilting Eileen! Good job! I hadn't had a chance to read any blogs lately and just now saw your log cabin blocks. They look neat! It's going to be a really nice quilt when it's finished.